Double K Airmax Dries Animals Faster Than Any Dryer In its Class! NOTE: The variable speed is not yet available in international voltage. The 2 speed is available in international voltage. Double K Industries Airmax Variable Speed Dryer allows for complete control of the air volume and velocity: You get full high speed down to a very low speed, and everything in between! The new dial control means more flexibility in grooming with the ability to cater the air flow to the animal and your grooming needs. Choose full power for large full coated animals, moderate speeds for ears and drying sensitive areas or medium coated breeds and low air volume for small animals, cats or young/sensitive animals. Twist on nozzles - All nozzles twist-on to the hoses to prevent "pop-off" that can occur with other forced air dryers. 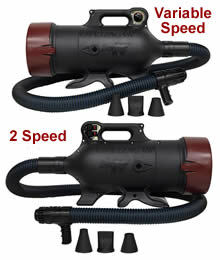 Includes 3 versatile attachments for any drying need - Comes with the unique "air sweep nozzle" for pushing water from the animal's coat! Hoses are crushproof and heat resistant. The Challengair AirMax has two speeds and two temperatures. Durable housing is virtually indestructible and will not rust, dent or crack as metal housings can. The AirMax will retain its beauty much longer than metal dryers. The AirMax is less expensive than comparable dryers, offering you better value. Comes with a two year limited warranty which includes hoses and nozzles. 30 day purchase money back satisfaction guarantee. Includes 6 foot crush proof hose and multiple nozzles. This lightweight Double K Airmax Dryer has two motors that work in tandem. One supercharges the other, or they work individually, giving you a choice of speed and temperature. Powerful motors reduce brushing time as forced air penetrates even the thickest undercoats. Flow through motor system warms air to 60 degrees above room temperature as it circulates through the motor system for greater electrical savings. Rustproof, impact-resistant housing is durable and long-lasting. Produces more air due to the aerodynamic housing design and a smooth hose lining (less ridges inside the hose), reducing resistance when air travels through the hose, thereby increasing the air volume. All nozzles twist-on to the hoses to prevent pop-off. The housing is virtually indestructible and will not rust, dent or crack as metal housings can. It will retain its beauty much longer than metal dryers. Great Air Volume, Velocity and Heat. Efficient and Versatile. Lightweight, Economical, Durable, Rustproof and Impact Resistant. Made in USA.